If you don’t have your data in at least three places then it doesn’t exist. I am a fiend for backing up for that reason and I think I’ve found the perfect set-up in my Promise R2+ and Synology network. For my production drive I use a Promise R2+ 6TB drive. So all the photos and videos that I’m working on at the moment live on that drive. I then use an application called Carbon Copy Cloner to copy that drive at 1am to another 4TB USB drive and then at 3am to my Synology network drive. Then at 5am, that Promise drive in my office is backed up to another Synology. The logic here is that having one copy is not a backup. Because if your machine dies and you only have one “backup” you actually only have one version now and what happens if that drive fails before you can replace the failed one? 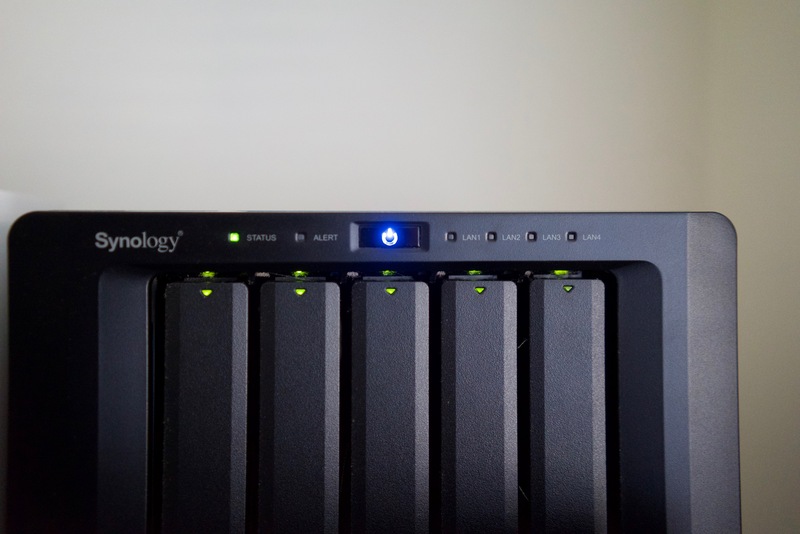 The Synology is what’s called a NAS or network attached storage drive. The models I have are the 1515+ and they are absolutely essential to my workflow. They have 5 drive bays that are seen by my computer as a single drive. So I have 3x10TB of storage for my back up. That may seem excessive, but trust me, when you start working with 4K video, it really starts to add up. I’ve used other makes of NAS drives before and I’ve found the Synology to be the best for my needs. They have some great features. 1. They have their own processes, so they are like mini computers, which leads to some really good things, the first of which is that they are super fast. 2. Another plus of having their own operating system means you can install apps. Synology make their own apps and the ones I use the most are the remote access apps. This means I can access all the stuff on my Synology from my iPhone or iPad anywhere in the world, which is pretty cool and has proven to be useful a number of times already. I also have my iTunes library on there, which saves space on my computer and means all my devices on my network can access my iTunes library. 3. The drive bays are tool-less, which means it’s really easy to install new drives, and you can do that easily when you run out of space. 4. You access the settings via a web interface. Whilst this may not seem like a plus, it is if the alternative is to install some crappy Java app. For those who like being able to fiddle with all the settings, you’ve still got a heck of a lot of control over the system. I held off getting a Synology for quite a while because I thought it would be too complicated to use, but it is way easier than I thought it would be to set up and use. 5. You can use just about any drive you want in them. You can even mix and match. So maybe 5 x 3TB drives like I have and then when you are running out of space and hopefully 4TB drives have gotten cheaper, you can replace two or three and the system will re-adjust and add the space. 6. They just work. With storage, having all those extra features is great, but at the end of the day, you just want it to be reliable and there when you need it. Lee Herbet was born in the Middle East, grew up in Africa, lived in Europe, New Zealand and now calls Australia home. Lee is a trainer, videographer and photographer. Lee worked in the Apple world for 10 years as a trainer, which was a great place to feed his creative spark. He now has his own company creating corporate videos and running workshops around the world on photography and video production.